Just another reason I love the summer months! I love eating all kinds of berries. Here in Oregon, June is the month for our local strawberry season. They are small, sweet, and super tender. When I saw the first batch arrive in our grocery store, I knew right away what I wanted to make. 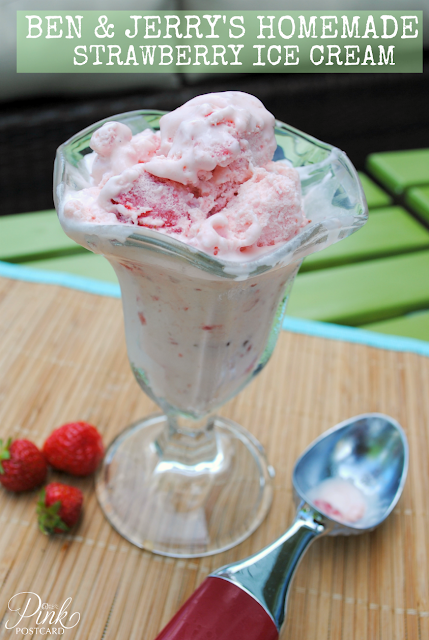 Have you ever made homemade ice cream? It's so much fun, and there is nothing like a fresh batch. We got the Ben & Jerry's ice cream cookbook as a wedding gift 20 years ago, and we have really enjoyed trying out the treats. it really does make a difference! Combine strawberries, sugar and lemon juice in a mixing bowl. Cover and refrigerate at least one hour. Whisk the eggs in a large mixing bowl until light and fluffy. Whisk in the sugar, a little at a time, then continue whisking until completely blended, about a minute more. Pour in the cream and milk and whisk to blend. 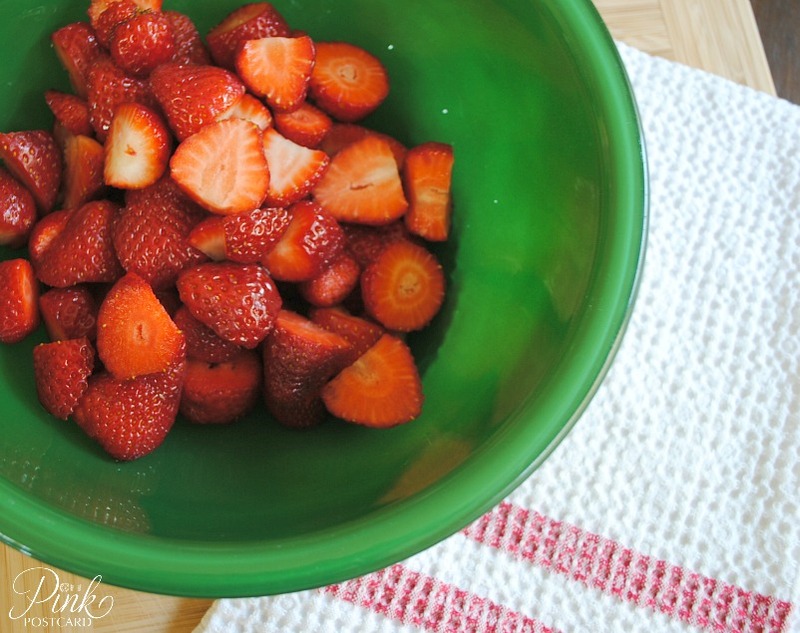 Mash the strawberries with a masher, or puree. Stir into the sweet cream base. Transfer the mixture to an ice cream maker and freeze according to manufacturer's directions. Make sure you have ice cream or rock salt and lots of ice on hand to make your ice cream. Yummy!! Being originally from Vermont I have been to the Ben and Jerry's plant a few times..... I even worked on one of the dairy farms that sold exclusively to B&J. They were regularly checked to be sure they did not give their cows anything not approved by B&J. Love that it is not full of chemicals! Your ice-cream looks sooo good! OMG Ben & Jerry's has a ice cream recipe book?!?! Why have I not heard of this before? Thanks for posting the recipe- the ice cream looks delish. Going research right now where I can find one of those books! Thanks for taking the time to leave me a note! Visit Pink Postcard's profile on Pinterest. milk paint in a can or milk paint powder? © 2015 Noble Vintage. Ashleigh Template designed by Georgia Lou Studios All rights reserved.